What have we learned in the past 250 years? I was recently listening to a discussion about the plans for traveling to the planet Mars with all the challenges and dangers that will be faced by these space travelers. Interestingly, the 18th century explorations of Capt. James Cook are being used as examples of how to prepare for such dangerous and long missions into the unknown. That began my research into how Capt. Cook prepared for and conducted his missions, especially, how he addressed the healthcare needs of his crew and I wondered how relevant his methods of then were today? How do you create the healthiest contained environment that will maintain and preserve the health of your crew for extended periods of time? In Capt. Cook's case, a trip around the world took three years. Is there a single answer or are there multiple elements that are present in a holistic approach? How are the lessons learned in those times still relevant to our own personal healthcare efforts today? With the identification of Vitamin C in 1912, 144 years after Cook's voyages, we now know that this vitamin in the diet is the single most important ingredient in preventing scurvy. (2) But, there were many things undertaken by Capt. Cook that positively affected the health of his men. History mainly focuses on the consumption of vitamin-C rich foods, but it often overlooks the other elements that I think are also part of Capt. Cook's success. While much of it was centered around diet, he also focused on hygiene and a consideration of the environment and the contentment of his men. These all were vital components of what I think represents a holistic viewpoint in healthcare. Did Capt. Cook have a holistic viewpoint and apply preventive health measures during these scientific expeditions? I also wish to explore the question, what have we learned that is still applicable today from these explorations which occurred 250 years ago between 1768 - 1779? What do know about scurvy and its symptoms today? The Institute of Tropical Medicine in Antwerp, Belgium states, "Vitamin C is also known as ascorbic acid. This name refers to ‘antiscorbutic’ (from the Low German term for scurvy: schorbock). Vitamin C is essential for the production of collagen. The symptoms of scurvy can be traced back to defective collagen. Collagen is the commonest protein in the animal kingdom. Large amounts of unusual amino acids are found in collagen: hydroxylysine and hydroxyproline. These are essential for the chemical stability of collagen. In scurvy, defective pro-alpha chains are formed (the formation of hydroxy-amino acids is disrupted). They do not form a triple helix and are quickly degraded. The consequences are first noticed first in the tissues where collagen turnover is fastest, such as blood vessels. Owing to the gradual loss of the existing collagen, the blood vessels become progressively fragile." (3) For the sailors of the day stricken with scurvy, they noticed bleeding gums, teeth falling out, open sores and internal bleeding. It was a terribly devastating condition. After Admiral Anso's tremendous losses with an expedition with six ships and almost 2,000 men, Lt. James Cook's mission included one ship and approximately 100 men. 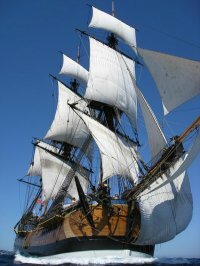 Rather than a fast and large ship like a schooner, Cook chose a sturdy, but slow collier (freighter) named the Earl of Pembroke and renamed it His Majesty's Bark, Endeavour. With this sturdy ship, Capt. Cook set off for the South Pacific and the eight month voyage to Tahiti on his scientific expedition to view and record the Transit of Venus in an attempt to measure the planet's distance from Earth. to sail because of this deficiency. Emphasis on that time was on cure; no one had conceived of the prevention of scurvy. Group 2: 25 drops of elixir vitriol t.i.d. Group 6 made an astonishing recovery and were fit for duty in 6 days. Cider was the second best remedy. He was fighting against that ancient terror of the sea, so much worse than winds and waves, the disease of scurvy; and he had a fighting faith in fresh food. What I find important in the words of Capt. Cook and others is that he did not put his faith into only one type of food or one technique but he wisely used a comprehensive holistic approach considering diet, environment and the psychological health of his men. And, as has been pointed out, his efforts were for PREVENTING disease rather than focusing on a cure. I see great parallels between his efforts and his successes and what we do with Touch for Health, where we take a holistic viewpoint and work to maintain balance in multiple areas of our lives as we practice self-care and preventive measures to preserve our wellness and balance. (9) While Capt. Cook's superiors had charged him with cosmological and discovery goals, Cook himself was additionally focused on the health and survival of his crew while achieving his assigned missions. 4. Carrying and using a variety of substances which had known or suspected antiscorbutic properties. 6. Most relevant here, malt (partly germinated then dried barley), and inspissated juice of wort and beer. first ever occurrence to prevent a disease. generally prove unsuccessful, unless supported by certain rules of living. The crew were at three watches, except upon some extraordinary occasions. And they had generally dry clothes to shift themselves when they got wet. Care was also taken to expose them as little as possible. Proper methods were employed to keep their persons, hammocks, bedding, cloaths, confidently clean and dry. Equal pains were taken to keep the ship clean and dry between the decks. Once or twice a week she was aired with fires; and when this could not be done, she was smoaked with gunpowder moistened with vinegar or water. Proper care was taken of the ships coppers, so that they were kept confidently clean. The fat, which boiled out the salt beef and pork, I never suffered to be given to the people as is customary; being of opinion that it promotes the scurvy. I never failed to take in water wherever it was to be procured, even when we did not seem to want it; because I look upon fresh water from the shore to be much more wholesome than that which has been kept some time on board. Of this essential article we were never at an allowance, but had always abundance for every necessary purpose. I am convinced, that with plenty of fresh water, and a close attention to cleanliness, a ship's company will seldom be afflicted with the scurvy, though they should not be provided with any of the antiscorbutics before mentioned. by Capt. Cook, particularly, fermented cabbage that we now know as sauerkraut. discovery of 'Tea Tree Oil' in Australia. I find this statement especially interesting as we explore the holistic approach Capt. Cook was taking to preserve the health of his men and to prevent scurvy. As we now know, the mind-body connection is very powerful and that depression can negatively affect and suppress the immune system. Now we see Capt. Cook using tea tree as a remedy for preventing scurvy and that also has other benefits that help fight off depression. attention by researchers but deserve more research. The mind-body aspects of Capt. Cook's techniques have not received much attention by researchers but deserves more research, in my opinion. We know in Touch for Health that emotional and mental states are one of the crucial aspects of a holistic approach. I think Capt. Cook had more than a strong hunch that the emotional state of his men needed to be addressed as part of the total solution. This belief coupled with the belief in fermentation might have led him to put more emphasis on one element of his antiscorbutic solution than it deserved. In his letter to the Royal Society of London, Capt. Cook states, "We had on board a large quantity of Malt, of which was sweet wort, and given (not only to those men who had manifest symptoms of the scurvy, but to such also as were, from circumstances, judged to be most liable to that disorder) from one to two to three pints in the day to each man, or in such proportions as the surgeon thought necessary; which sometimes amounted to three quarts in the twenty-four hours. This is without doubt one of the best antiscorbutic sea-medicines yet found out; and if given in time will, with proper attention to other things, I am persuaded, prevent the scurvy from making any great progress for a considerable time: but I am not altogether of opinion, that it will cure it in an advanced state at sea." So, we have a history of using ale and beer in naval operations plus the recommendations of James Lind, the discoverer of the fact that scurvy could be prevented by citrus exclaiming the virtues of the fermented alcoholic tonics. It is my opinion that while these liquids did not have a medicinal curative property, they did affect the men's overall mental and emotional state positively thereby positively affecting their immune system and was one element of Capt. Cook's success on these very long voyages. Home-sickness, melancholy and what was then termed 'nostalgia' were very potent obstacles facing Cook as he worked to preserve the Overall Health of his men both physically and psychologically. We know that abuse of alcohol has detrimental affects also; dehydration and injury being two of these. We also know that Capt. Cook emphasized having an abundance of clean and fresh water for consumption as part of his solution and I doubt he would of allowed the abuse of alcohol by his crew. He is known to have withheld a crewman's ration of daily 'grog' for disciplinary purposes so had control over the supply. I hope that you see through the discourse in this article that Capt. Cook took a holistic approach and made history by working to prevent a disease through a diet consisting of as much fresh food as possible and including fermented and pickled foods high in vitamin-C; fresh water; exercise; protection from the elements; controlled work schedules; providing amusement and liquid refreshment for enjoyment; maintaining a clean and dry environment; providing clean and dry clothing; and gaining the respect of his men through example rather than threat. This holistic approach to healthcare in the late 1700's had very dramatic effects on man's ability to travel long distances in a healthy manner without succumbing to the dreaded scurvy through the attention to diet and environment. Even today, those facts are not fully understood and applied by modern healthcare professionals even though their merits were proven centuries ago. I have elected to present to you an account of a non-medical explorer, a layman in our eyes, who exerted a profound influence on the eradication of a disease known from ancient times. He accomplished this without much, if any, understanding of the nature of its etiodology, but in so doing he significantly altered world history. So, how did Capt. Cook fare with his own health over these nine years of round-the-world explorations? It appears that he was spared the ravages of scurvy by eating the diet he prescribed to his men but there are modern theories about his later health that came about because of his willingness to explore new foods. In a way, he made himself a test subject for research by eating many things, especially meat, in its 'fresh' state which meant foregoing proper cooking that would kill parasites and other bacteria. Capt. Cook was killed in Hawaii by the natives so his death was not directly caused by the state of his health. But, some historians and researchers have raised the question about his health on the later voyages and how these affected his temperament and decision-making abilities which could of indirectly caused his death. These will be discussed more thoroughly in a companion website that will examine Capt. Cook the man, in more detail. Following are some of the theories about Capt. Cook's later health. The Captain Cook Society states in the article, Factors Governing Cook, "Sir James Watt has established a perception of two Cooks - a healthy Cook of the first voyage and of the first part of the second - and an unwell Cook of the latter part of the second voyage and of all of the third. Cook’s first reported major illness was in December 1773, during the second ice-edge search of the Antarctic Ocean (Pacific sector), during the second voyage. This was after his second visit of 1773 to Queen Charlotte Sound - 3 to 25 November 1773 - but before his third visit there - 19 October - 10 November 1774. By 27 February 1774 Cook had: developed serious gastrointestinal symptoms which he first concealed, treating himself by starvation until intestinal colic intervened. Purgatives merely increased the vomiting, and constipation became absolute and was associated with such violent hiccoughs that he almost died - a classic picture of acute intestinal obstruction. W.R. Thrower’s diagnosis was, "acute infection of the gallbladder with secondary paralytic ileus", but Sir James Watt’s opinion is that: since Cook was anything but fastidious about eating native foods, he had a heavy ascaris (roundworm) infestation of the intestine, a condition that can cause acute obstruction. Earl Cook - co-developer of the eTouch for Health, TFH eCharts, John Thie Memorial Online Research Database and the eInstructor software systems. Earl and his wife, Gail, have worked with Touch for Health since 1976 when a seven-year old injury of Earl's was fixed in only seconds using TFH and acupressure. They worked closely with TFH founder John Thie and Matthew Thie is developing the eTouch software. Earl is a Professional Touch for Health Instructor and Chair of the Research Committee for the Touch for Health Kinesiology Association in the U.S.. He is a microcomputer pioneer and has worked in the computer industry since 1980. As a consultant and software application developer, Earl has solved complex problems for some of the world's largest organizations. Post Script: Earl is also the author of a research site examining whether his family was related to Capt. Cook. Earl's father, James Cook, stated that there was a "first-cousin relationship" to Capt. Cook. 2. The history of scurvy and vitamin C by KJ Carpenter. Cambridge University Press, 1986.